On Friday I met with Mimi. Mimi is a friend of a friend. (Thank you Rosalie!) A lovely, retired woman who was looking to sell a few things. (She knew that I bought stuff to resell in my Etsy store.) We talked for a bit and got to know each other and then she pointed out various things in the apartment that she thought she’d like to sell. And I realized what I pleasant way this was to find bits to resell!! None of the early morning drama of estate sales, the disappointment of yard sales, the sifting through the flotsam and jetsam in thrift stores or the danger of meeting with Craigslist sellers. But of course I wanted to be doubly sure I “did right” by her. That I offered fair prices for both of us. But it was tough because I couldn’t access Google on my phone in her apartment to research stuff. I finally went down a hallway and outside to get access…which was a bit awkward. In the end, I realized I would need to do more research on some items, but I did buy a few things. 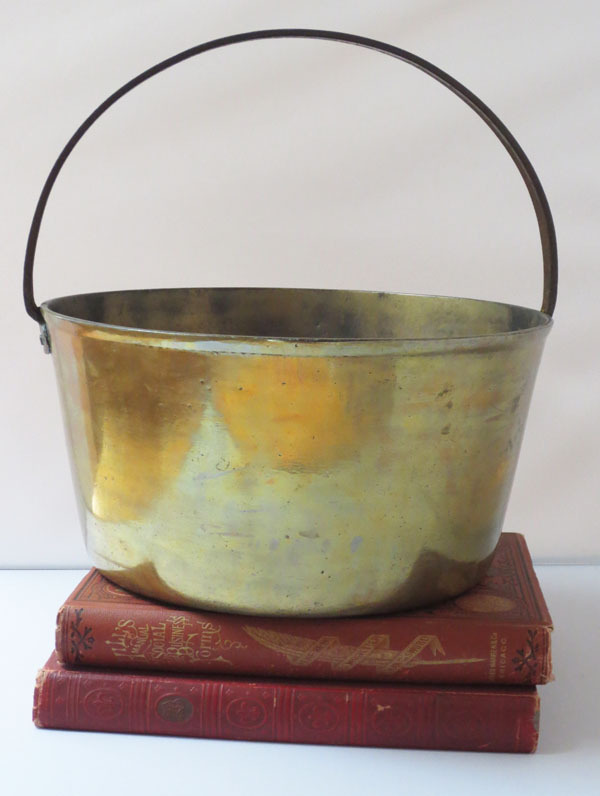 One of the first items she had me look at was a large brass pot with a cast iron handle. It’s a jelly pot from England, circa late 1800s. Brought over by her family from Scotland and used for decades and decades by her mom and grandma. It shows wear and some light corrosion inside (it was used as a planter at some point) and a bit of rust on the iron handle, but is a sturdy, heavy (9 pounds) piece that was too fabulous to pass up. I can picture it by a fireplace with kindling or pinecones. Late 1800s brass jelly pot with cast iron handle. A 9-pound beauty. In the mid-century range she offered a George Briard “Forbidden Fruit” glass serving tray. So delightful. Just a few tiny chips in all the years of use. 1950s/60s Georges Briard Forbidden Fruit serving tray. And there was a fun 1950s copper and enamel pin and clip earring set by Matisse. Too cute, right?! Copper and enamel pin and earrings by Matisse. She also pointed out this old brass teapot brought to the U.S. by her Scottish grandmother. It’s a Victorian-era JCB (James Clews of Birmingham) teapot/toddy kettle with an amber glass handle and four feet. (Love these little feet.) Other than a few small dents and a bit of wear, it’s a beauty. 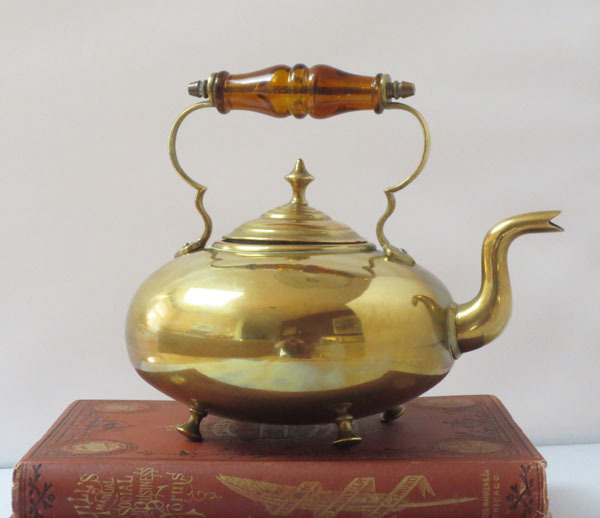 Antique James Clews brass teapot. Will it sell quickly? Probably not. It’s rather old-fashioned, but I could picture it in a B & B or a country kitchen. The hardest part was figuring out the “fair to both” price for the things I wanted to buy. In the end I offered a lump sum for these four pieces along with two other pieces of jewelry. She decided against selling the other jewelry and we negotiated a price for the four. That was the only uncomfortable bit of the whole experience for both of us! These will all be in my store soon, but if you are interested in anything, let me know.